Start the presses! Tucson's favorite printing company is anxious to print and mail out our newly reinstated bi-monthly company newsletter, The Complete Spectrum. 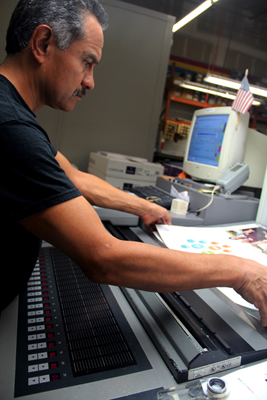 In Behind the Scenes, we take a closer look into the realm of prepress, printing, bindery, and mailing. Our July/August edition features George Villanueva, Lead Press Operator, "When clients visit to see a print proof, I calm them when they might be worried how it will look. This is all part of the process when color gets together and things happen on the press. There's nothing to worry about - it will be nominal. I tell them, 'I will meet your expectations.' I may be mechanically inclined, but I have an eye for quality color." Sign-up to receive a FREE subscription to The Complete Spectrum.